Previous days were important days for Iranian due to designating of new ministers. Hassan Rouhani picked Masoud Karbasian as a new economy minister in his second four-year tenure as Iran’s president and as a result, Karbasian introduced his new plan. Designated Economy minister mentioned high interest rate must be reasonable. He noted that this illogical high interest rate is because of serious and chronic problems in banking system in Iran. In the last three years, inflation rate decreased from 35% to 9% but interest rates on loans just reduced insignificantly from 22% to 18%. In last year, the gap between loan interest rates and inflation rate reached around ten percent. Accordingly, he presented a comprehensive plan to reform banking system in order to improve their lending power and boost domestic production. As a result, determining the impacts of the minister’s plan on different industries such as automobile, steel, iron ore mining, drugs, cement and petrochemical should be highlighted. In the following, all selected companies are big ones which are traded in Tehran Stock Exchange. The automobile industry in Iran had 3% share of gross domestic product in 2016. Comparing to previous years, this share has fallen dramatically and it was mainly because of imposed sanctions against Iran. In this article, Iran Khodro (IKCO1), Saipa (SIPA1), Pars Khodro (PKOD1), Zamyad (ZMYD1), Iran Khodro Diesel (KAVR1) and Saipa Diesel (SPDZ1) has been selected for comparing their Interest expenses in Iran. In 1395 (Solar year), they paid more than 40,000 billion Rials (around 1 billion USD) as Interest expense. Following figure illustrates trend for ratio of interest expense to sales for these companies. 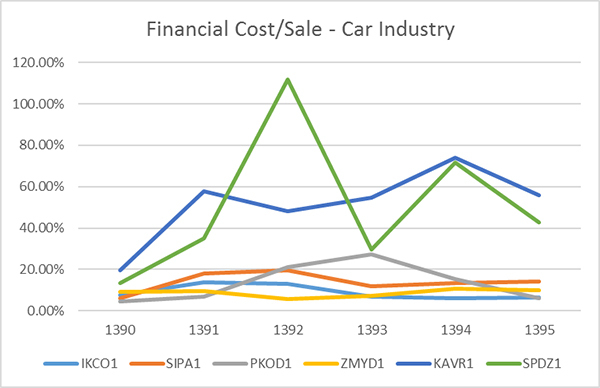 While IKCO1 and PKOD1 managed their interest expenses well, and SIPA1 didn’t allow the situation getting tougher, but commercial vehicle makers (KAVR1 and SPDZ1) spend even more than 50% of their total revenue as interest expense to lenders. Cement industry’s share of GDP is around 0.5% and the discussed ratio for cement industry has followed a positive trend. 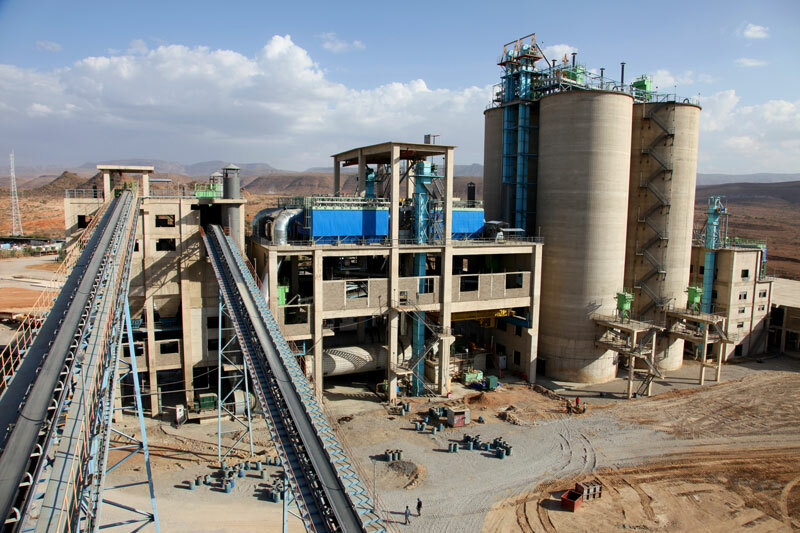 However, Iran is rich in material for producing cement and factories are well diversified through the country but they confronted many problems such as lack of demand and environmental constraints. In addition, the pricing is being done fully by the government. By this way, the companies which are active in this field have faced demand deficiency not only for deep recession in construction sector of Iran but also because of self-sufficiency and also decline in demand due to the ongoing war in neighbors’ countries exclusively Iraq. Tehran Cement (STEH1), Shargh Cement (SSHR1) and Sepahan Cement (SSEP1) are selected as a sample in this study. Ratio of financial cost to sale is increasing obviously and they paid near 25% of their sales to lender on average. 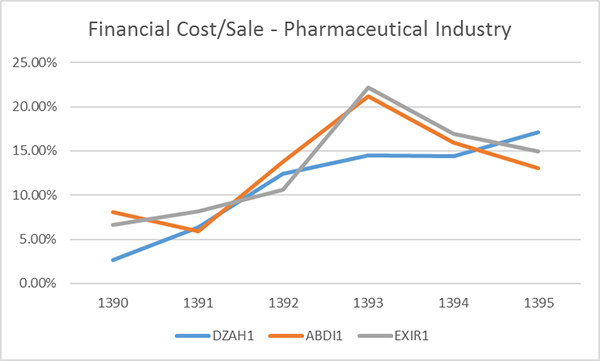 In pharmaceutical sector, three stated-owned holdings possess near two thirds of its market share in Iran. Since the duration of management in stated-owned companies are not normally long enough in Iran, the managers are not interested to be engaged in innovation, venture capital and development plans. They are obliged to follow their mother companies’ policies strictly. According to their policies, a big proportion of profits outflow from these companies as dividend annually. Consequently, companies faced lacks of cash for daily operational costs and therefore they had to borrow from other sources. Three companies which are listed in Tehran Stock Exchange has been selected for this study; Zahravi Pharmaceutical (DZAH1), Abidi Pharma (DABDI1) and Exir Pharmaceutical (DXIR1). Last year, these companies paid around 15% of their revenues as interest. The ratio reduced in last two years as reduction in loan interest proportionately in ABDI1 and EXIR1. Basic metal industry faces different problems during the recent years that are mostly because of plunge in metal prices in the global market as well as some problems in Iran due to the sanction and also demand reduction in construction industry. The JCPOA along with increment in metal price globally evolved steel industry and caused to rescue from collapsing. 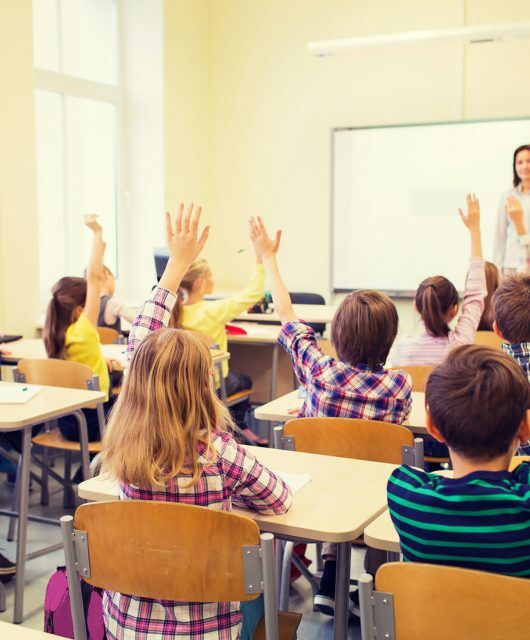 Stated-owned companies in this industry confronted massive non-operational costs, then it made reduce competitiveness and effective advantages such as cheap energy and labor force. By governmental support like imposing tariff on cheap Chinese steel and allocating export incentives, these companies revived such that steel production and steel crude export increased by 13% and 67% respectively in 3 first months from mid-March 2017 (begging of 1396 solar year) comparing to the same time in last year. Esfahan’s Mobarakeh Steel (FOLD1), Esfahan Steel Co (ZOBZ1), Khouzestan Steel Co (FKHZ1) and Arfa Iron and steel Co (ARFZ1) are picked up as a sample for this study. Last year financial cost of these companies reduced and mentioned ratio decreased subsequently. Additionally, this ratio in ZOBZ1 is being high since two years ago. 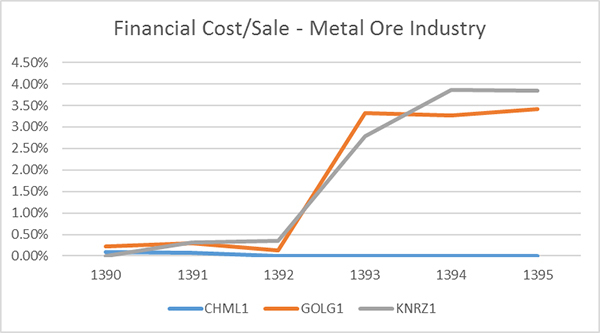 Although, Iron ore companies run many development plans, they are not in trouble of excessive financial costs. Because managers of iron ore mines, invest a big fraction of their profits in development plans due to completion of steel chain in order to gain governmental advantages (detailed information would be available in the following article: “Royalty Patent in Iran”). Thus, they do not need to borrow from other sources. Chadormalu (CHML1), Golgohar (GOLG1) and Saba Noor (KNRZ1) are selected among listed companies in stock market in this sector for this study. Nevertheless, ratio of financial cost to sale for these companies were ascending, they are still in a safe condition and faraway from trouble. As an interesting point, Chadormalu’s financial cost is almost zero. 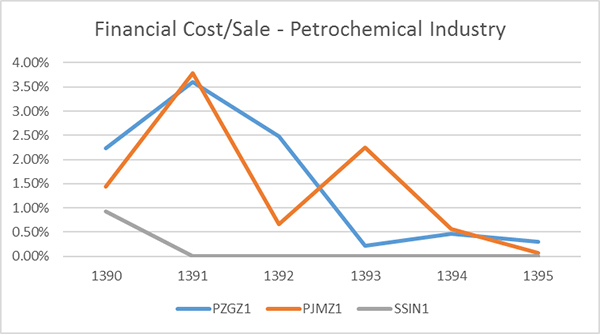 Petrochemical’s ratio as same as metal ore industry is not significant in order to be noticed. The companies have been selected for this discussion are: Zagros Petrochemical Co (PZGZ1), Jam Petrochemical Co (PZGZ1) and Iran Chemical Industrial Investment Co (SSIN1). To put it in a nutshell, if the minister’s plan based on reform in banking system is performed properly, reduction in interest rate would be anticipated. Consequently, all industries will benefit from this pleasant event but some of them more specifically such as automobile, steel, cement and pharmaceutical. Decrease in interest rates is herald of lower financial costs and more profits in financial statements. 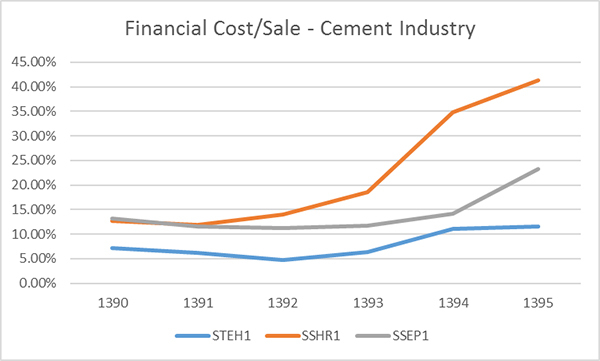 All carmakers, cement producers especially SSHR1, pharmaceutical, steel makers mainly ZOBZ1 take advantage of this reform but industries like Iron ore and petrochemical are not much sensitive for interest rate reduction because of low financial costs.